Dot drill rate of fire? When you shoot the dot drill with a center fire rifle , what is your typical rate of fire? How much cool down time to allow heat dissipation? With a good heavy barrel, can you go nonstop and only pause for reloading and rebuilding NPOA? What would you minimum spec a barrel out at for a long action such as a 30-06 for such a string of fire? I was looking at a Benchmark #5 and a Lilja #4 to replace my factory 270 barrel with. The Lilja #4 is probably too thin but would the Benchmark #5 at 0.700" muzzle and 1.250 breach be able to take the heat? Most Palma stuff is around 0.750" for a 20 shots for score in 20 minutes rate of fire with 2 sighters allowed. Found a deal on a McMillan Classic Hunter for $400 also. My Birch stock chipped so after this season I will probably restock and rebarrel. Just want a nice all around deer, hog, stray coyote rifle that can use off the shelf ammo in a desperate situation or if I sell it to someone that doesn't reload at a later date. Will be testing my 110 VMax loads this weekend. Sometimes I will stare at a dot for what seems like 2 minutes. When my mind is wandering...it doesn't matter where the crosshairs are the bullet is gonna miss. I try to only shoot when I have my mind fully under control and In the shot and sometimes it takes a while. Other times i can get 5 shots off in 60 seconds. I would say that it takes me on average 10 minutes to shoot a dot drill. I don't wait on my barrel and I don't see accuracy falling off at the end due to barrel heat. I usually put everything I have into the last dot...and it usually hits showing me that the rifle has not lost accuracy. My barrel is the medium contour for DT rifles. It is heavier than factory...but not a full 1.250" straight. I think it is 1.250 for 6" or so and then straight 1.05" or something like that for the remaining 22". The first 6" or so are held by the action as well. I don't know anything about how lighter barrels preform as I haven't shot them. Another advantage of your rifle is the long clamping area around the barrel wicking away the heat right where it is hottest. I will routinely run a dot drill in a minute or so. I'll stop after 10 for a mag change, but otherwise it's all business. I've done this quite a few times with all of my serious rifles in short action cartridges. When the powder capacity gets up over 50gr... I tend to give the rifle a break. I'll slow up my firing cadence quite a bit as the powder charge creeps up. Big magnums just don't tolerate that kind of rapid firing. Though my .223AI, 6BR, 22CM, etc... they will all just get the hammer dropped. When its time to kill dots it's time to kill dots. Yes, after 20rnds they are all hot enough to burn your hand up by the suppressor... but I've done it enough times and they are still poking 1/4moa groups 1000rnds+ later. It goes without saying that the fewer times you do this the healthier it is for barrels and brass. Though I often do things for the sake of science... so I've run 2 mags back to back in well under a minute in my 6br and .223AI quite a few times. I've even done a 40rnd string like that, as fast as I could get through them while maintaining precision, in my 6BR. I think I could have got burned through my suppressor cover when I was done with that. 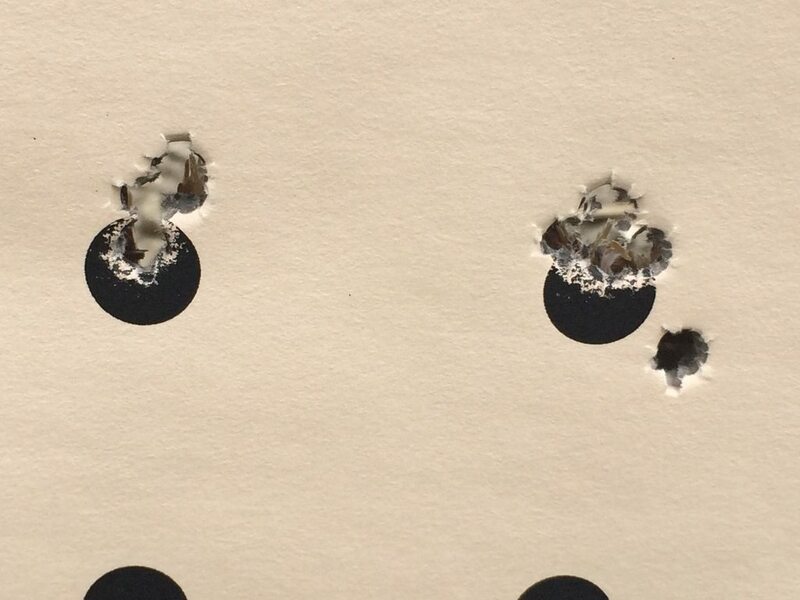 That was about 500rnds ago, and here is a couple groups I shot just a few days ago with that same 6BR at 100yds. I had just cleaned it, so the first group on the left had a bit of vertical. The one way out the bottom was because my son, whom likes to sit behind me and watch, tripped over my feet just as the shot broke. As you can see, the rifle is still shooting crazy good, even after being abused by me in the name of science several times. Thanks. I am browsing for Hodgdon online load data. Lots of loads for 30-06 with a 155 Palma style are supposed to be around 2900+ and in the low 50+ grains powder weight. Looking for the best blend of lower pressure and still a decent velocity with a moderate case fill. 4350 and H414 are compressed at 60 grains but Varget is within 50 fps at only 50.7. H4895 is looking good and I have a pound of that and some 4064. 24" barrel in my Garand. For my 270, loads are not nearly as fast for the same bullet weight and powder. Is that due to the smaller bore causing restrictions on gas expansion? It is a 100-200 fps drop compared to a 30-06. Dropping to a 6.5-06 it is still slow. 6.5 Creedmoor Speeds basically around 2700-2800 despite having 60 grains of case capacity. Different case geometry than the 6.5PRC you showed yesterday but similar capacity yet much lower velocities. Looks like when it is rebarrel time for the 270, I will go bigger bore to a 280 or 30-06. This is to be expected. Powder column configuration matters. Narrow and long are far less efficient than short and fat.